Magna Wave is widely used in the show circuit to help horses perform better and recover faster from competition. Dr. Christine uses it as an alternative to drugs for the treatment of pain and inflammation due to arthritis, injuries, and performance stress. 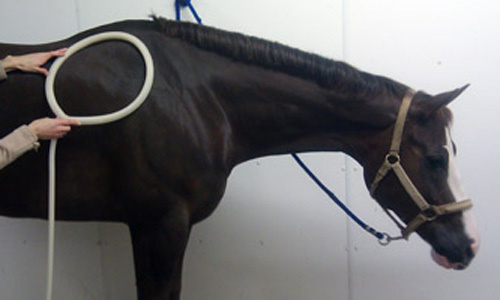 If your horse suffers from back soreness, arthritis, poor circulation, tendon, muscle or bone issues, Magna Wave therapy is the solution you have been looking for. Magna Wave PEMF (Pulsed Electro-Magnetic Field) The therapy serves to help regenerate damaged or diseased tissue. It enhances the synthesis of protein in the cells, which allows the body to take full advantage of all the protein available. Circulation is improved, and during treatment the Lymphatic system is stimulated to clean damaged areas and detoxify the body. Magna Wave PEMF therapy also increases blood oxygen at the cellular level. Studies have shown that blood oxygen can be increased by as much as 100 to 200%. Magna Wave PEMF, because of its deep penetration is particularly effective in relieving deep muscle soreness. The therapy is non invasive, and no medication is required as a pretreatment for therapy. Normal treatment time is 20 to 40 minutes. Yes, day out or day of at trainer’s discretion. OK for use in FEI. Immediately, there is no recovery time. This is at trainer’s discretion; some prefer waiting a couple of hours. PURPOSE: This four year study used human donors “to define the most effective electromagnetic fields for enhancing growth and repair in tissues”. RESULTS: The PEMF used in the study caused accelerated growth rate, and resulted in “greater cell viability” (85% vs. 65%). NASA’s CONCLUSION: “We have clearly demonstrated the bioelectric/biochemical potentiation of nerve stimulation and restoration in humans as a documented reality”. Recently, after using the Magnawave on my mare, I was very impressed with the results. I have a 12-year-old all-around Quarter Horse that tore her suspensory two years ago, and re-strained it now, causing it to become inflamed. After using the Magnawave twice, I was amazed to see noticeable improvement and soundness. The swelling was gone, and even the calcified scar tissue from the original injury had diminished. I highly recommend that you try a Magnawave treatment.